3m Film going right over curtains! Painting ceilings in a home or office is easier with 3m film. By adhering the plastic to the wall/ceiling joint and draping it over wall out lets, switches, doors, casing and baseboard you can quickly and easily paint a ceiling with an airless sprayer or your favorite roller cover. 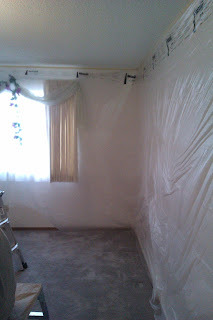 As a rule once carpet is in the home we only spray ceilings and never spray walls. The risk getting paint onto carpet is too great. 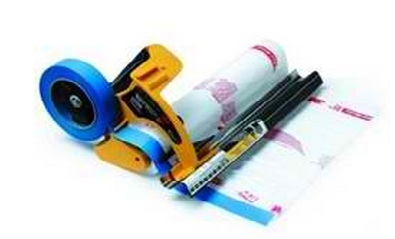 The amount of labor needed to tape off the carpet and all other flooring and baseboards far outweighs the benefit. Once the plastic is hung from the ceilings the floors are very easily protected by leak proof drop cloths. The fine over spray that falls from the ceiling is absorbed into the canvas drops. You could use plastic to protect the floor as a cheaper alternative but the paint over spray creates a sticky situation and makes its really hard to walk around while spraying the ceiling. Canvas also has more weight and less risk of being blown away by the airless sprayer. Here is a little secret. When you need to prime popcorn ceilings use an oil base paint. If you use latex they will just reactivate the drywall mud and it will come down in sheets. Most newbie painters figure this out the first time they are hired to paint an acoustic ceiling... having to tell a home owner that you just ruined their ceiling must be difficult. $62.99 and cost of tape and platic. 3m Masking Films are the bomb digity. We use them over the traditional tape and heavy plastic method. That sentence points out the flaw with heavy plastic its heavy. When you spray a ceiling with latex paint the chemicals in the paint cause the glue to "loosen" and the heavy plastic pulls all of your hard prep work down. The 3m hand masker is an expensive item. The Paint Store has it for $62.89. That's a hefty price tag for most. But never fear there is always an alternative right. You can buy rolls of pre-masked plastic. 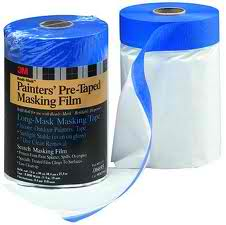 The blue stuff from 3m is overrated and overpriced too. We load our machines with 2020 1'' masking tape. The blue stuff is kinda costly and a little less tacky that 2020. You cant find blue 2020 on the pre-taped rolls but the blue will suffice. So next time you spray a ceiling choose the clingy static plastic and save yourself the headache of taping up plastic after if falls of the wall.